According to reports in Auto Bild Motorsport, Mark Webber has a first right to refusal for the second seat at Red Bull Racing and is backed by team owner Dietrich Mateschitz. Few names, including that of 2007 World Champion Raikkonen, have been thrown around as a replacement for Webber, who had fallen out with Vettel over the 'Multi-21' saga. 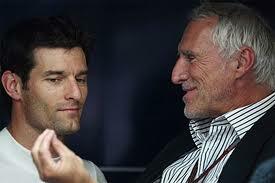 Webber has since come out to say that the 'ball is my court' and that his relationship with billionaire Mateschitz remains strong. “I’ll continue to be in touch with him on where my thinking is at, where my energy levels are, and where my motivation is for still operating at this level,” he said. Based on Auto Bild’s report, Die Welt newspaper reports that Mateschitz has “personally presented the Australian with an offer to extend his contract”. The report added that Webber will consider the offer until the end of August, when Red Bull usually turn their attention to the team’s next year's driver lineup.